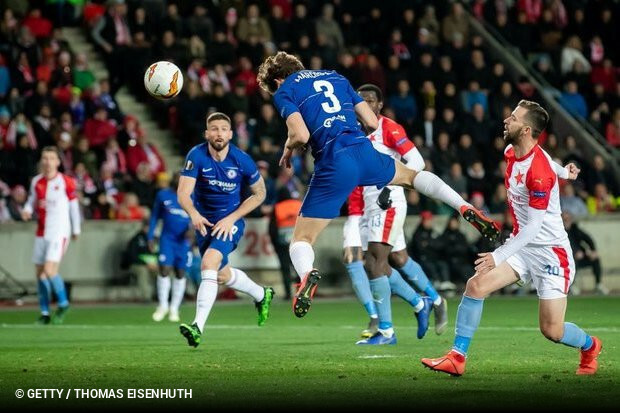 Marcos Alonso's late header handed Chelsea a narrow 1-0 victory in their Europa League quarter-final first-leg with Slavia Prague. The game was a turgid affair and Chelsea flattered to deceive for much of the half. They failed to muster a single shot on target, although Willian did strike the bar after cutting onto his right foot on the edge of the box. Alonso ghosted in to meet Willian's inch-perfect ball with four minutes of normal time remaining to give Chelsea a scarcely deserved win in the Czech Republic. Alonso has been a bit-part player in recent weeks after seeing a dip in form, but his header from Willian's cross ensures Maurizio Sarri's favourites for the competition are in the driving seat ahead of next week's home leg at Stamford Bridge.